Apoptosis allows the clearance of unwanted cells from living tissues without causing inflammation. Processing of phagocytosed apoptotic cells yields Ags that access the cytosol and the MHC class I pathway of engulfing cells and are recognized by Ag-specific CTL. We show here that injection of apoptotic RMA cells, a syngeneic T cell lymphoma, into C57BL/6 mice results in priming of a functional and long-lasting tumor-specific immune response. Cross-priming of CTLs by apoptotic cells requires CD4+ T cell help. Apoptotic cells, however, are at least 20-fold less immunogenic than nonreplicating live cells. Immunogenicity of apoptotic cells is proportional to the number of cells injected, correlates with the serum concentration of IL-10 and IL-1β cytokines, and is enhanced in IL-10 knockout mice. Moreover, immunization with dendritic cells (DCs), but not macrophages (Mφ), pulsed with apoptotic cells primes tumor-specific CTLs and confers protection against a tumor challenge. Our findings demonstrate that tumor cells undergoing apoptosis are, though scarcely, immunogenic in vivo, outline the different roles of Mφ and DCs in the physiologic clearance of unwanted cells, and have implications in designing immunomodulating vaccines. The mechanism by which dying cells are swiftly recognized and phagocytosed by scavenger cells is the subject of intense investigation (1, 2). However, the fate of the Ags contained in the apoptotic cell as well as the constraints defining their immunogenicity are so far poorly understood. Processing of phagocytosed apoptotic cells yields Ags that access the cytosol and the MHC class I pathway of engulfing scavenger cells via a TAP-dependent mechanism, and are recognized by Ag-specific CTL (3). This raises the possibility that a specific CTL response may be primed against Ags contained in apoptotic cells. In vitro evidences, however, exclude a direct role for macrophages (Mφ)3 in the activation of a specific immune response. Monocytes/Mφ, upon engulfment of apoptotic cells, release immunoregulatory factors like IL-10 and TGF-β (4, 5), and, after phagocytosis of monocytes committed to apoptosis by viral infection, do not elicit a specific CTL response (6). On the other hand, dendritic cells (DCs) pulsed with apoptotic monocytes activated in vitro virus-specific CTLs (6). Therefore, depending on the scavengers involved in the clearance of apoptotic cells, the result in terms of specific immune response may be opposite. Furthermore, massive cellular destruction enhances cross-presentation of peripheral self Ags in vivo (7). We reasoned that the balance between turning off and on of the immune system against the dying cells might be influenced by the relative amounts of cells undergoing apoptosis at a given time, and by the APCs involved in their clearance. To investigate the immunogenic potential of apoptotic cells in vivo, we used the highly tumorigenic (minimal tumorigenic dose: 103 cells) Rauscher virus-induced H-2b T cell lymphoma RMA (8, 9). RMA cells easily undergo apoptosis either by UV irradiation or by mitomycin C treatment, followed by serum deprivation (3). In this study, we show that apoptotic tumor cells can be immunogenic in vivo, but are less immunogenic than nonreplicating (NR) live tumor cells. The immunogenicity of apoptotic cells appears to be tightly dependent on the APCs involved in processing and presentation of the antigenic material contained in the apoptotic cells, and on the balance among immunomodulatory cytokines. C57BL/6 and IL-10−/− (10) female mice, 6- to 8-wk old (Charles River, Calco, Italy), were housed in a pathogen-free animal facility and treated in accordance with the European Community guidelines and the Institute Ethical Committee. Apoptosis was induced either by treatment with mitomycin C (50 μg/ml for 30 min at 37°C) followed by serum deprivation or by UV irradiation, and verified as previously described (3). Cells were injected 24 and 48 h after mitomycin C treatment or UV irradiation. As previously reported (3), at that time, >95% of the cells were in advanced apoptosis, as detected by staining with annexin V and analysis of the DNA content (data not shown). Necrosis was induced by exposing the cells to 3–5 cycles of rapid freezing/thawing in H2O (4 × 107/ml) until cell membrane integrity was lost. NR cells were obtained by treatment with mitomycin C (11) and injected immediately thereafter. Phagocytosis of apoptotic cells was assessed by flow cytometry (3). Briefly, mice were injected i.p. with 107 apoptotic (Apo) or NR-RMA cells, which were previously labeled with the PKH2-GL aliphatic green fluorochrome, according to the manufacturer’s instructions (Sigma, St. Louis, MO), and sacrificed at different time points. Peritoneal cells were collected and analyzed by flow cytometry after staining with anti-MAC-1 PE-conjugated mAb (PharMingen, San Diego, CA) or immediately after addition of the vital dye ethidium bromide (EB). EB allows to discriminate between phagocytes, which actually engulfed apoptotic cells, and phagocytes, which bind to but do not internalize them. Living cell membranes exclude the dye, which, therefore, does not stain internalized apoptotic cells. Mφ that phagocytosed apoptotic cells are identified as green fluorescent cells, whereas those that bound to, but do not internalize apoptotic cells, are identified as double positive cells. In parallel, peritoneal cells from mice injected with unlabeled Apo- or NR-RMA cells were stained with anti-MAC-1 PE-conjugated mAb, anti-CD80, anti-CD86, anti-MHC class I, anti-IAb, and anti-CD40 FITC-conjugated mAbs (PharMingen) and analyzed by flow cytometry. Mφ and DCs were derived by culturing bone marrow precursors for 7–10 days in culture medium containing 20 ng/ml murine recombinant M-CSF or GM-CSF (3, 12). Mφ and DCs were pulsed overnight with a 1:5 ratio of Apo-RMA cells. As assessed by flow cytometry, >95% of the cells cultured in the presence of either one of the two growth factors expressed MAC-1, Kb, and Db membrane molecules. The cells collected from the plates cultured in the presence of GM-CSF also expressed the classical DC markers N418, IAb, CD40, CD80, and CD86 (data not shown). After apoptotic cell pulsing, DCs showed a phenotypic pattern of mature cells (13). The phenotypic pattern of Mφ was not modified by the overnight incubation with apoptotic cells (data not shown). For immunization, peritoneal cells were collected 20 h after the injection of 107 Apo-RMA cells or PBS, as described above. Mice were injected i.p. or s.c. with 0.5 ml PBS or the indicated number of NR-, Apo-, necrotic (Necro) RMA cells, Apo-EL4G cells, 2 × 105 Mφ or DCs, or peritoneal cells from the corresponding number of mice. Fourteen days later, mice were either sacrificed and their spleen cells collected, or challenged s.c. in the opposite flank with 104 RMA cells and checked for tumor appearance every other day. Tumor appearance and size were evaluated by measuring two perpendicular diameters by a caliper every other day. Animals were scored positive when the mean of the two perpendicular diameters of the tumor was >2 mm. Mice with no palpable tumor 8 wk after tumor challenge were scored negative and rechallenged in the opposite flank with 104 RMA cells. Cell depletion experiments with mAbs and carragenan were conducted as previously described (11, 14). When indicated, mice were injected i.p with 1 μg of GM-CSF 30 min before injection of Apo-RMA cells. 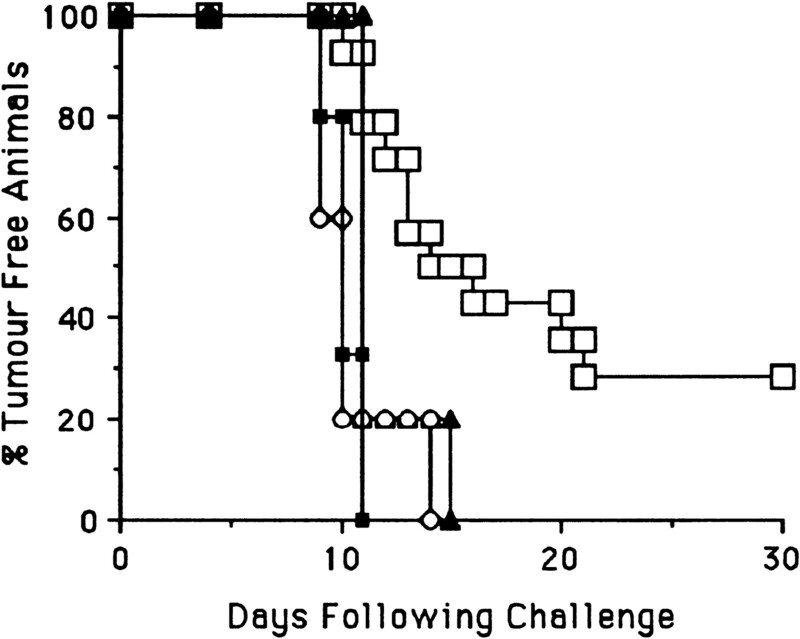 T-enriched cells were prepared from the spleens of vaccinated mice as described (15), resuspended in RPMI 1640 containing 10% heat inactivated FCS, 50 μM 2-ME, 2 mM l-glutamine, 10 mM HEPES, 1 mM sodium pyruvate, 100 U/ml penicillin, and 100 μg/ml streptomycin (culture medium) and coincubated with 3 × 106 mitomycin C-treated RMA cells at an effector-stimulator ratio of 10:1. After 4 days of culture, blasts were isolated on a lympholyte-M gradient (Cedarlane, Hornby, Ontario, Canada), cultured for an additional day in medium supplemented with 20 IU/ml human rIL-2 and tested for cytolytic activity in a 4-h 51Cr release assay (11). Sera were collected by cardiac puncture 20 h (for cytokine titration), or, for IgG titration, 2 wk (for the first injection) or 1 wk (for the second injection), after immunization and frozen. For anti-RMA IgG titration, targets (103 51Cr-labeled RMA or Jurkat cells) were added to V-bottom wells of microtiter plates, incubated for 1 h at 37°C with serial dilution of normal or immune sera, and washed. Rabbit complement (1:40 dilution; Cedarlane) was added to each well, and plates were incubated for 2 h at 37°C. A total of 100 μl/well were collected and counted in a gamma counter. Cytokine titration was performed by ELISA kits following the manufacturers instructions (Endogen, Woburn, MA). Statistical analyses were performed using the Log-Rank, Wilcoxon, and Fisher-Exact tests. Comparison of survival curves was considered statistically significant for p < 0.05. RMA is a well-characterized tumor model, whose immunogenicity is strongly biased by the expression of virus-related T cell epitopes (16). A single injection of ≤106 NR-RMA cells protects H-2b mice from a further challenge with RMA cells (17). We recently reported that Apo-RMA cells were swiftly phagocytosed by H-2b peritoneal Mφ, and that a subpopulation of engulfing Mφ was able to present Apo-RMA-derived epitopes to RMA-specific CTLs (3). To verify whether Apo-RMA cells were able to activate in vivo a tumor-specific immune response, we injected C57BL/6 mice with increasing numbers of Apo-RMA cells and measured the ability of their T-enriched spleen cells (15), after in vitro restimulation, to kill 51Cr-labeled RMA cells. Indeed, mice injected with Apo-RMA cells developed a tumor-specific CTL response (Fig. 1⇓A, first panel). This response was not due to an in vitro priming of anti-RMA CTLs, since spleen cells from PBS-injected animals never killed RMA targets (Fig. 1⇓A, fourth panel). Twenty-fold more Apo-RMA than NR-RMA cells were necessary to induce similar responses (Fig. 1⇓A, first and second panels). RMA cells killed by necrosis (Necro-RMA) never elicited tumor-specific CTLs (Fig. 1⇓A, third panel), therefore excluding that immunogenicity was due to soluble Ags released by the dying cells. Injection of a large number of Apo-RMA cells activate a specific immune response in vivo. A, T-enriched spleen cells (15) from mice immunized i.p. 14 days before with 0.5 × 106 (○), 5 × 106 (▪), 107 (□), 2 × 107 (▵) Apo-RMA (first panel), NR-RMA (second panel), Necro-RMA (third panel) cells or PBS (▴; fourth panel) were cultured for 5 days in the presence of RMA cells and tested in 4-h 51Cr-release assays. Curves represent the cytotoxicity against RMA. Lysis of YAC-1 (H-2k/d) and EL-4G (H-2b) targets was always <5% (data not shown). Values are expressed as percentage (average of triplicates) of specific 51Cr release at the indicated E:T ratios. B, Sera were collected 2 wk after the first injection (left panel, 1×) or 1 wk after the second injection (right panel, 2×) of Apo-RMA (•), NR-RMA (▪) cells or PBS (▴) and tested in complement dependent cytotoxicity assays. Curves represent the cytotoxicity against RMA. Lysis of Jurkat cells was always <5% (data not shown). Values are expressed as percentage (average of triplicates) of specific 51Cr release at the indicated sera dilution. Each experiment reproduced in the figure was repeated at least three times with similar results. Vaccination with Apo-RMA cells specifically activated also CD4+ T cells and B cells, as documented by the presence of anti-RMA IgGs in the sera of injected animals. Anti-RMA IgGs were detectable in animals immunized once, and their titer further increased after a boost with apoptotic cells (Fig. 1⇑B). Jurkat cells, a human T cell leukemia line, were never recognized (data not shown). To investigate the in vivo efficacy of the immune response recruited by Apo-RMA cells, immunized mice were challenged s.c. with 104 RMA cells. A significant protection and delay in tumor appearance was evident at Apo-RMA cells doses ≥107 (Table I⇓). Doubling the dose of apoptotic cells increased the percentage of protected animals, even though it never reached the gold standard obtained by immunization with 0.5 × 106 NR-RMA cells (100% protection; Table I⇓). 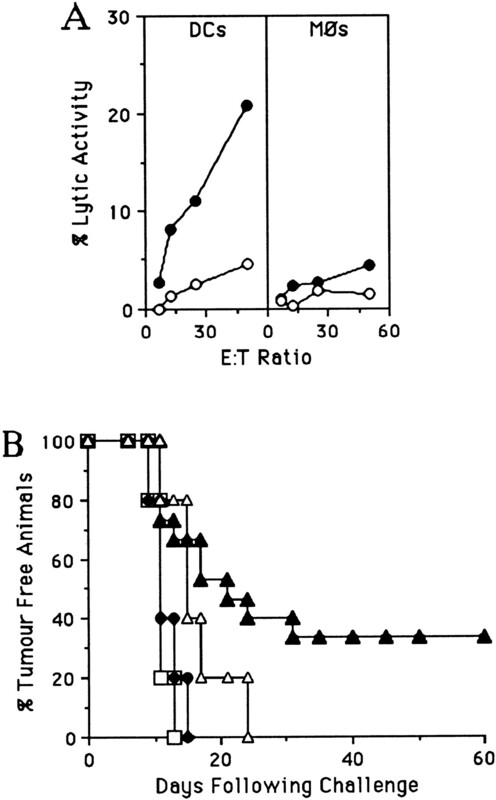 The immune response elicited by apoptotic cells is endowed with the characteristics of a mature immune response including specificity, since apoptotic EL-4G cells, a syngeneic chemically induced T cell lymphoma, did not protect against RMA, and memory, since all immunized animals rejected a second challenge of RMA (Table I⇓). Necro-RMA cell administration did not elicit any protective response (Table I⇓). Optimal tumor-specific CTL induction, even for class II-negative tumors like RMA, requires cognate CD4+ T cell help (18, 19). Similar constraints apply to the antitumor response elicited by apoptotic cells. In fact, both treatments of anti-CD4 or anti-CD8 mAbs during the induction and the effector phases of the response, and not treatment with rat Ig, abrogated the protection induced by vaccination with Apo-RMA cells (Fig. 2⇓). The protective immune response elicited in vivo by immunization with Apo-RMA cells depends both on CD4+ and CD8+ T cells. Mice undergoing immunization with 107 Apo-RMA cells were injected i.p. with purified rat IgG (n = 10; □), with anti-CD4 (n = 5, GK 1.5 hybridoma; ▴) or anti-CD8 (n = 5, 53.6.72 hybridoma; ○) mAbs (five injections for a total of 1.2 mg/mouse). As control, a group of mice was injected with PBS only (n = 10; ▪). Two weeks after the injection of Apo-RMA cells, mice were challenged s.c. in the left flank with 104 RMA cells (i.e., 10-fold the minimal tumorigenic dose). Animals were scored positive when the mean of the two perpendicular diameter of the tumor was >2 mm. The data are presented as a Kaplan Meier plot. Statistical comparison, conducted by the Log Rank test, of the survival curves gave the following results: rat IgG vs PBS, p < 0.0001; rat IgG vs anti-CD4, p < 0.01; and rat IgG vs anti-CD8, p < 0.002. Results in Figs. 1⇑ and 2⇑ and Table I⇑ demonstrate that cells undergoing apoptosis may elicit an immune response that stems from the interaction among all components of the adaptive immune response (i.e., CTLs, Th, and B cells), and requires the direct involvement of professional APCs. Mφ are the best-characterized scavenger phagocytes (1). Their ability to cross-prime T lymphocytes may be quenched by the fact that apoptotic cell clearance by Mφ associates with secretion of immunoregulatory factors, such as IL-10 and TGF-β (4, 5). IL-10, in particular, negatively affects the maturation and Ag processing/presentation potential of DCs (20, 21) and skews DC precursors toward a Mφ-like scavenger pathway (22). Conversely, proinflammatory cytokines, like IL-1β, trigger DC maturation (20, 21). DCs, which also recognize and internalize apoptotic cells, elicited in vitro virus-specific CTLs (6). Therefore, we measured the concentration of IL-10 and IL-1β in the sera of mice immunized with the subimmunogenic (i.e., 5 × 106) or the immunogenic (i.e., 107) dose of Apo-RMA cells, and compared them with the data obtained in mice immunized with NR-RMA cells. Indeed, we found that efficacy or failure of our vaccination procedure correlated with IL-10 and IL-1β concentration in the sera of vaccinated animals (Fig. 3⇓A). 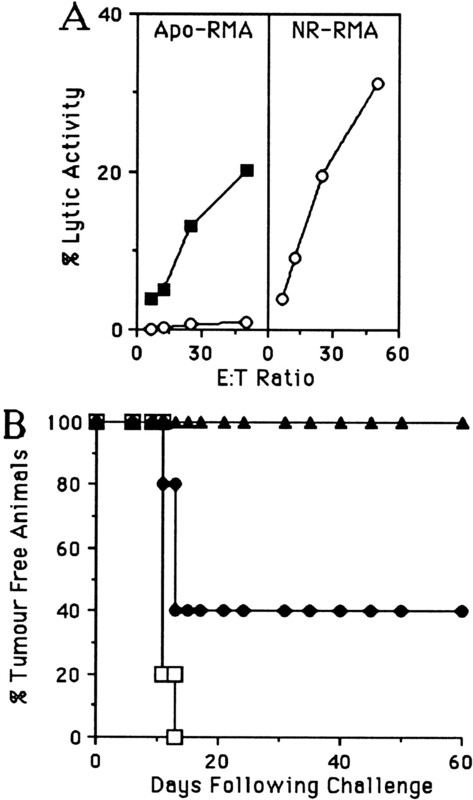 Protection elicited by 107 apoptotic cells associated with high IL-10 (p < 0.03 when compared with PBS-injected animals) and IL-1β (p < 0.008) secretion. However, when IL-10 (p < 0.001) exceeded by far IL-1β levels, as in the sera of mice injected with 5 × 106 apoptotic cells, vaccination did not elicit any response. NR-RMA cells (5 × 105) did not induce IL-10 secretion above the background level (i.e., mice injected with PBS), while constantly triggering the release of IL-1β (p < 0.01). Besides the actual concentration of each cytokine, in animals injected with both NR or high numbers of Apo-RMA cells, the ratio between IL-10 and IL-1β was comparatively low. Fig. 3⇓B reports the mean among the ratios between IL-10 and IL-1β concentration in the sera of each single vaccinated animal. 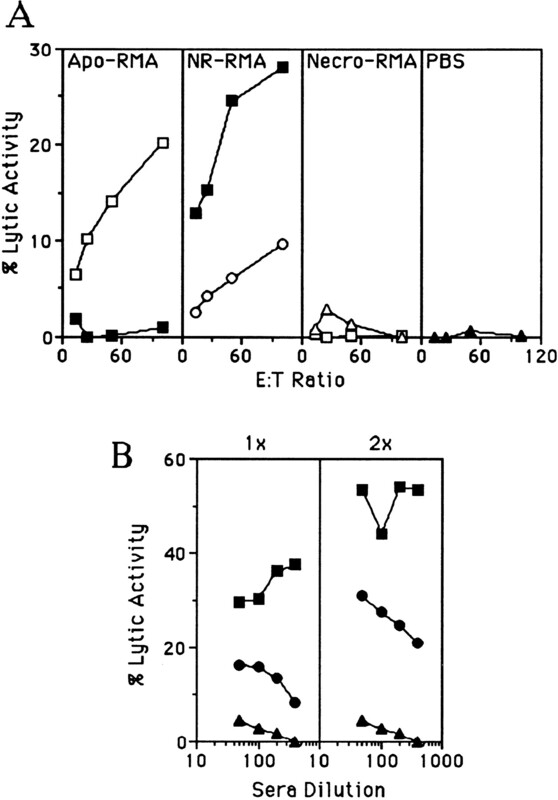 On the contrary, in mice injected with low numbers of apoptotic cells (i.e., 5 × 106), IL-10 exceeded by far the IL-1β concentration (Fig. 3⇓B). 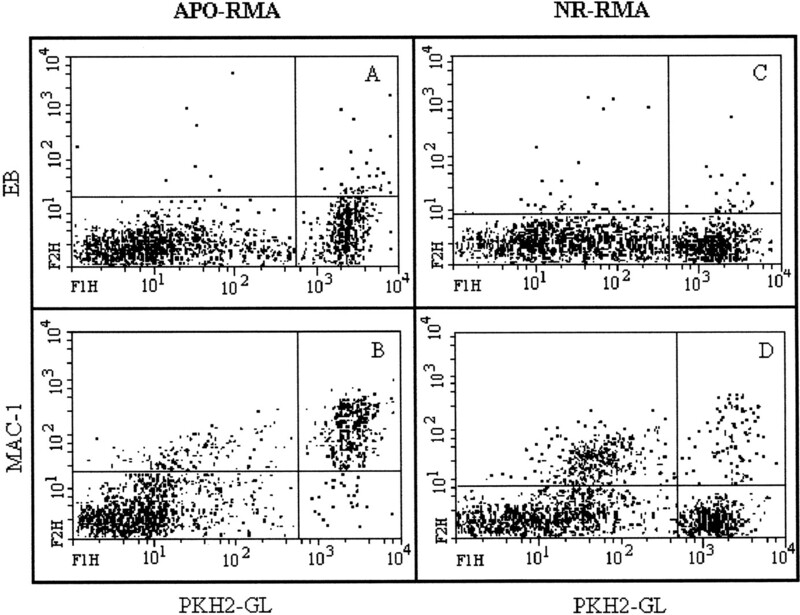 No substantial difference in serum levels of IFN-γ or TNF-α was detected among animals injected with Apo-RMA cells (5 or 10 × 106/animal) or PBS (8, 8, and 7 animals, respectively) (data not shown). Efficacy or failure of the vaccination with apoptotic cells correlates with the pattern of secreted cytokines. A, Serum concentration of IL-10 (left panel) and IL-1β (right panel) was assessed in mice injected 20 h before with one of the following preparations: PBS (9 and 5 mice for IL-10 and IL-1β determinations, respectively), 5 × 105 NR-RMA cells (8 and 5 mice, respectively), 5 × 106 (11 and 5 mice, respectively), or 107 (11 and 6 mice, respectively) Apo-RMA cells. Each symbol is representative of the determination in a single animal. The bars indicate the mean value for each animal’s group. Statistical comparison, conducted by the Wilcoxon test, resulted as follows: for IL-10, PBS vs 5 × 105 NR-RMA, NS; PBS vs 5 × 106 Apo-RMA, p < 0.01; PBS vs 107 Apo-RMA, p < 0.03. For IL-1β, PBS vs 5 × 105 NR-RMA, p < 0.01; PBS vs 5 × 106 Apo-RMA, NS; PBS vs 107 Apo-RMA, p < 0.008. B, Vaccination outcomes depend on the balance between IL-10 and IL-1β. Data are represented as the mean among the ratios between IL-10 and of IL-1β concentration in the sera of each vaccinated animal (5 × 105 NR-RMA, n = 5; 5 × 106 Apo-RMA, n = 5; 107 Apo-RMA, n = 6) (y-axis). In support of a direct role of IL-10 in limiting the immunogenicity of apoptotic cells in vivo, vaccination of IL-10−/− mice with a dose of Apo-RMA cells (i.e., 5 × 106), which is not immunogenic in IL-10+/+ mice (Fig. 1⇑ and Table I⇑), efficiently elicited RMA-specific CTLs (Fig. 4⇓A) and protected 40% of the mice challenged with RMA cells (Fig. 4⇓B). When the dose of immunogen was reduced to 0.5 × 106 cells, NR-RMA elicited a strong anti-RMA CTL response, whereas Apo-RMA cells still failed to elicit CTLs in IL-10−/− mice (Fig. 4⇓A), suggesting that multiple factors contribute to modulate the immunogenicity of apoptotic cells. The absence of IL-10 favors the antigenic potential of Apo-RMA cells. A, T-enriched spleen cells from IL-10−/− mice injected with 0.5 × 106 (○) or 5 × 106 (▪) Apo-RMA (left panel) or NR-RMA (right panel) cells were restimulated in vitro with RMA cells and tested for their lytic activity in a 4-h 51Cr-release assay. Curves represent the cytotoxicity against RMA. Lysis of YAC-1 and EL-4G targets was always <5% (data not shown). Values are expressed as percentage (average of triplicates) of specific 51Cr release at the indicated E:T ratios. The panels represent one of at least two independent experiments that gave similar results. B, IL-10−/− mice were injected i.p. with PBS (n = 5; □), 5 × 106 Apo-RMA cells (n = 5; •), or 0.5 × 106 NR-RMA cells (n = 5; ▴) and challenged 2 wk later s.c. in the left flank with 1 × 104 RMA cells. Values are expressed as percentage of tumor-free animals at the indicated time after tumor challenge. Statistical comparison, conducted by the Log Rank test, gave the following results: for PBS vs 5 × 106 Apo-RMA cells, p < 0.049; PBS vs 0.5 × 106 NR-RMA cells, p < 0.0016. To verify whether peritoneal Mφ were indeed involved in the clearance of apoptotic cells, green-fluorescent Apo-RMA cells were injected i.p. As assessed by flow cytometry of peritoneal cells, 4 and 20 h after injection, 74.8 ± 2.5 and 86.1 ± 1.6%, respectively, of MAC-1+ peritoneal cells were actively phagocytosing apoptotic cells, and few labeled apoptotic cells were not internalized (<5%). In Fig. 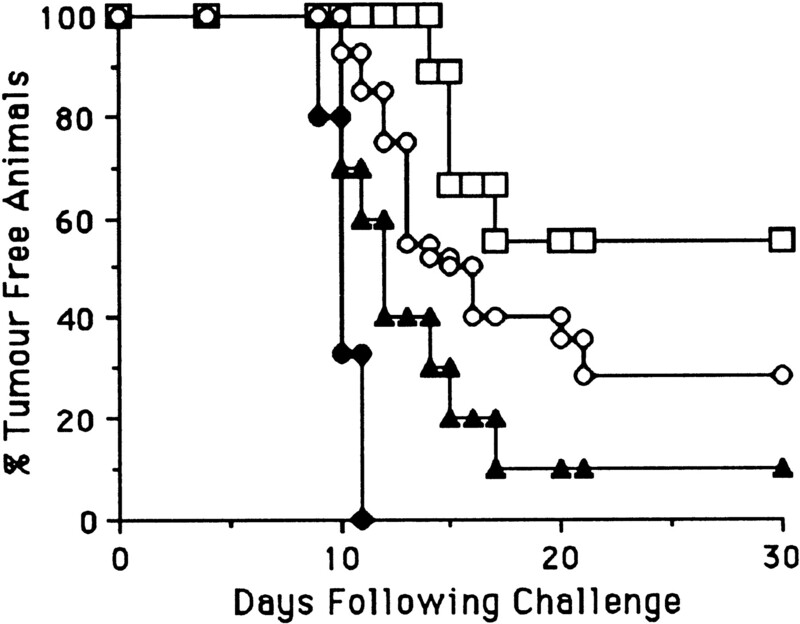 5⇓, representative experiments of in vivo phagocytosis 20 h after i.p. injection of Apo- (panels A and B) or NR-RMA cells (panels C and D) are reported. At FACS analysis, apoptotic cells are depicted as PKH2-GL+/EB+; NR-RMA cells, which do not internalize EB, are PKH2-GL+ only. Massive phagocytosis of Apo-RMA cells is demonstrated by the almost complete absence of double positive cells (Fig. 5⇓A). In fact, internalized apoptotic cells are not stained by EB, but make phagocytes PKH2-GL+. Fig. 5⇓B shows that most of the MAC-1+ cells (which represent the 51 ± 6% of the entire peritoneal population) are actively phagocytosing apoptotic cells. Most phagocytosing MAC-1+ cells expressed very low amounts of membrane MHC class II, CD80, and CD86 molecules (data not shown), a phenotype characteristic of Mφ. Altogether, these data are strongly suggestive for a massive and unique involvement of peritoneal Mφ in the phagocytosis of apoptotic cells. Fig. 5⇓, C and D, shows that NR-RMA cells are still present in the peritoneum of injected animals 20 h after inoculum. Because NR-RMA cells are still alive, they do not internalize EB and, therefore, do not allow identification of phagocytosis by scavenger cells. However, the fact that most of the MAC-1+ cells are not PKH2-GL+, strongly suggests that peritoneal Mφ are not phagocytosing NR-RMA cells. Less than 10% double positive cells in Fig. 5⇓D may represent either NR-RMA cells attached to the surface of MAC-1+ cells, or NR-RMA cells undergoing secondary apoptosis (Fig. 5C⇓), eventually phagocytosed by Mφ. Peritoneal MAC-1+ cells efficiently engulf apoptotic cells in vivo. C57BL/6 mice were injected i.p. with 107 Apo (left panels) or NR-RMA cells (right panels) labeled with the green fluorochrome PKH2-GL and sacrificed 20 h later. Peritoneal cells were collected and analyzed by flow cytometry after staining with anti-MAC-1 PE-conjugated mAb or immediately after addition of the vital dye EB. Analysis was conducted on the ungated population of which MAC-1+ cells were the 51 ± 6%. A, The lower right quadrant shows Apo-RMA cells (PKH2-GL+) phagocytosed by cells that prevent the staining of apoptotic cells by EB. Less than 5% double positive cells are still floating in the peritoneal fluid (upper right quadrant). B, The upper right quadrant shows that most of the MAC-1+ cells are phagocytosing Apo-RMA cells, leaving <5% unphagocytosed apoptotic cells (lower right quadrant). C and D, NR-RMA cells are still present in the peritoneal fluid 20 h after injection (right quadrants). Because NR-RMA cells are still alive, they do not internalize EB (lower right quadrant of C) and, therefore, do not allow identification of phagocytosis by scavenger cells. However, the fact that most of the MAC-1+ cells are not PKH2-GL+ (upper left quadrant of D) strongly suggests that peritoneal Mφ are not phagocytosing NR-RMA cells. Less than 10% double positive cells in the upper right quadrant of D may represent either NR-RMA cells attached to the surface of MAC-1+ cells or NR-RMA cells undergoing secondary apoptosis, eventually phagocytosed by Mφ. We modulated the in vivo reactivity of MAC-1+ scavenger cells by treating mice with carragenan, which drastically reduces the functional activity of phagocytes (14), or GM-CSF, which enhances in vitro phagocytosis of apoptotic cells by scavengers (23). FACS analysis of the peritoneal cells 24 h after the last injection of carragenan showed a drastic reduction of MAC-1+ cells (<10%). The survival curves of animals treated with carragenan or GM-CSF before Apo-RMA cell injection and RMA challenge were consistently divergent (p < 0.008). A total of 56% of the Apo-RMA-vaccinated animals injected with carragenan were protected, compared with 10% of GM-CSF-treated animals (Fig. 6⇓), therefore giving an indirect evidence of the immunomodulatory role of Mφ in the induction of a specific immune response against tumor cells undergoing programmed death. The protective immune response elicited in vivo by immunization with Apo-RMA cells inversely correlates to the presence of professional phagocytes. Mice undergoing immunization with 107 Apo-RMA cells received repeated i.p. injections of PBS (n = 10; ○) or carragenan (n = 9, three injections for a total of 6 mg/mouse; □) or received a single i.p. injection of GM-CSF (1 μg/animal; n = 10; ▴). As control, a group of nonimmunized mice was injected with PBS only (n = 10; •). Two weeks after the injection of Apo-RMA cells, mice were challenged s.c. in the left flank with 104 RMA cells. Tumor appearance was evaluated as described in the legend of Fig. 1⇑. The data are presented as a Kaplan Meier plot. Statistical comparison, conducted by the Log Rank test, between the survival curves of the mice treated with carragenan or GM-CSF gave the following result: p < 0.008. To test the direct role of peritoneal Mφ in the induction of an immune response against Apo-RMA cells, peritoneal cells were collected from 10 C57BL/6 mice injected 20 h before with 107 Apo-RMA cells or PBS, pooled and injected immediately after i.p. into syngeneic animals. No protection against a challenge of RMA cells was obtained in both groups of animals (data not shown). Finally, we derived Mφ and DCs from bone marrow precursors (3, 12) and verified their ability, after pulsing with Apo-RMA cells, to elicit a tumor-specific immune response in vivo. Injection of Apo-RMA-pulsed DCs resulted in CTL priming (Fig. 7⇓A) and protection against a challenge with RMA cells (Fig. 7⇓B). As previously reported (3), Mφ efficiently internalized identical numbers of Apo-RMA cells (data not shown), but neither elicited a specific immune response (Fig. 7⇓A), nor allowed protection against a challenge with RMA cells (Fig. 7⇓B). Bone marrow-derived DCs and not Mφ pulsed with Apo-RMA cells activate a functional anti-tumor immune response. A, Mice were immunized with 2 × 105 bone marrow-derived DCs (left panel) or Mφ (right panel) pulsed with Apo-RMA cells. Two weeks later, animals were sacrificed, their T-enriched spleen cells restimulated in vitro with RMA cells, and tested for their lytic activity against 51Cr-labeled RMA (•) or YAC-1 (○) targets in a standard cytotoxicity assay. Values are expressed as percentage (average of triplicates) of specific 51Cr release at the indicated E:T ratios. The panels represent one of at least two independent experiments, which gave similar results. B, Alternatively, mice immunized with DCs or Mφ pulsed (n = 15, ▴; and n = 5, ▵, respectively) or not (n = 5, □ and n = 5, •, respectively) with Apo-RMA cells were challenged s.c. in the left flank with 104 RMA cells. Values are expressed as percentage of tumor-free animals at the indicated time after tumor challenge. Statistical comparison, conducted by the Log Rank test, resulted as follows: for DCs not pulsed vs DCs pulsed with Apo-RMA cells, p < 0.002; Mφ not pulsed vs Mφ pulsed with Apo-RMA cells, p < 0.047. Apoptosis is considered the most efficient system to get rid of unwanted cells without causing inflammation (1). Indeed, cells initiating programmed death undergo rapid changes (e.g., exposure of anionic phospholipids, binding of thrombospondin, modification of carbohydrates) that allow swift recognition and engulfment by scavenger cells (1). Clearance of intact dying cells prevents secondary necrosis of apoptotic cells and release of dangerous enzymes into the microenvironment (1). However, recent data lend weight to the hypothesis that, in particular circumstances, cells dying by apoptosis may trigger a specific immune response (reviewed in 24). We demonstrate here that apoptotic cells may be immunogenic in vivo, although with a much lower potential than live cells. Our data suggest that this complex event is regulated by several factors, including the number of cells undergoing programmed death, the APCs involved in engulfment, processing, and presentation of Ags contained in the apoptotic cells, and the cytokines released in the microenvironment. In wild-type H-2b mice, at least 107 Apo-RMA cells were required to elicit an RMA-specific immune response. The dose of Ag is 20-fold higher than the one needed for activation of a specific immune response by NR-RMA cells. The decreased immunogenicity might be correlated with decreased cell viability, while apoptotic cells may just represent a middle immunogenic population between viable cells and dead cells. This possibility is supported by the analysis of the in vivo phagocytosis of Apo- and NR-RMA cells. Although Apo-RMA cells are readily phagocytosed by scavenger cells and 20 h after injection <5% apoptotic cells are still floating in the peritoneal fluid, most of the NR-RMA cells are still alive by that time and eventually available for more efficient APC processing/presentation. It has been reported that the death of tumor cells by apoptotic pathway inversely correlates with their immunogenicity (25). Apoptosis requires the activation of a well-characterized family of cysteine aspartate proteases (26). Loss of immunogenicity of cells undergoing apoptosis may depend on the cleavage of relevant epitopes. The immunogenicity of RMA cells mostly depends on a single immunodominant viral CTL epitope (27), which is not altered in NR-RMA cells (16). The fact that CTLs specific for the immunodominant CTL epitope of RMA (16) kill a subset of Mφ-engulfing Apo-RMA cells (3) suggests that the immunodominant epitope is still present also in the antigenic repertoire of Apo-RMA cells. Experiments are in progress to verify whether apoptotic cells have a qualitative and/or quantitative alteration of their antigenic repertoire. Mφ are considered the most efficient scavenger cells (1). Our in vitro and in vivo data (Ref. 3, and this study) suggest that, in our system, Mφ are the scavenger cells mostly involved in phagocytosis of apoptotic tumor cells. Upon injection of 107 Apo-RMA cells, >85% of the peritoneal Mφ were actively phagocytosing dying cells, with <5% (i.e., < 0.5 × 106) apoptotic cells, which were not internalized. However, neither unpurified peritoneal cells from animals injected with Apo-RMA cells nor Apo-RMA-pulsed Mφ were able to elicit a specific immune response in vivo. Several considerations may explain the failure of Apo-RMA-pulsed Mφ to elicit a specific immune response. Processing of the dying cells by Mφ may lead to the production and presentation of an altered epitope repertoire (see above). The engulfment of Apo-RMA cells in Mφ does not trigger activation and up-regulation of MHC and costimulatory molecules. Finally, Mφ, upon engulfment of apoptotic cells may release immunomodulatory factors, such as IL-10 and TGF-β (4, 5). Indeed, we found that IL-10 was consistently released in the serum of animals immunized with apoptotic tumor cells. Moreover, we found that apoptotic tumor cells were more immunogenic in IL-10−/− mice. Mφ are not the unique producers of immunomodulatory cytokines, and we cannot exclude that apoptotic cells elicit different T cell differentiation and response (Th1/Th2), or the activation of T regulatory cells (28). The fact that IL-10−/− mice injected with 5 × 105 Apo-RMA cells, the equivalent immunogenic dose of NR-RMA cells, are not protected against a challenge of RMA cells suggests that other factors contribute to determine the scarce immunogenicity of apoptotic cells. DCs, the most potent APCs (20, 21), efficiently internalize apoptotic tumor cells and undergo maturative changes (13). Indeed, and to our knowledge this is the first report, DCs pulsed with apoptotic cells efficiently primed in vivo a tumor-specific CTL response and allowed rejection of a challenge with RMA cells. We have no direct evidence of the in vivo capture of apoptotic cells by DC, and we are currently investigating this issue. In preliminary experiments, we found that two of five animals injected s.c. with Apo-RMA cells were protected by a challenge in the opposite flank with RMA cells. Although the protection is relatively higher than the one obtained by i.p. injection of the same number of Apo-RMA cells (40% and 29%, respectively), the results are much lower than what expected by bypassing the peritoneal Mφ. We cannot exclude, however, that other mechanisms in distinct tissues operate similarly to the one described by us. Our results suggest that a prevalence of professional phagocytes (i.e., Mφ) may favor Ag sequestration and paralysis of the immune response via release of soluble factors. IL-10 is a major factor contributing to limiting apoptotic cell immunogenicity in vivo. In conditions of normal tissue turnover, this is likely to be the most common occurrence, favoring the noninflammatory, nonimmunogenic clearance of cells undergoing apoptosis. When the apoptotic cell meal overcomes scavenger phagocytes, immature DCs are possibly recruited. The balance between IL-10 and IL-1β may favor their further maturation and migration to secondary lymphatic tissues, where activation of a specific immune response takes place. However, in particular pathophysiologic conditions, apoptotic cells act as a source of Ag. The ability of DCs to prime in vivo specific T lymphocytes after internalization of apoptotic cells reconciles the physiologic removal of unwanted cells undergoing apoptosis without inflammation (1), with the involvement of apoptotic cells in other phenomena, such as cross-priming (6, 29, 30) and autoimmunity (31, 32). These results have implications in defining vaccination strategies. Manipulation of the mechanisms regulating apoptosis (33) as well as the balance between pro- and antiinflammatory cytokines (20, 21) may have direct/indirect effects on the APCs involved in processing and presentation of Ags from apoptotic cells and in switching the immune system on or off. We thank Maria Grazia Roncarolo and Marina Ferrarini for careful reading of the manuscript, Carlo Casati for the gift of the first group of IL-10−/− mice, and Giuseppe Consogno for excellent technical assistance. ↵1 This work was supported by the Fondazione San Raffaele del Monte Tabor, the Associazione Italiana per la Ricerca sul Cancro (AIRC), the Ministero della Sanita’, and the Ministero dell’Universita’ e della Ricerca Scientifica (MURST). 3 Abbreviations used in this paper: DC, dendritic cell; Mφ, macrophage; Apo, apoptotic; NR, nonreplicating; Necro, necrotic; EB, ethidium bromide.